What is your company niche, and what does your company do that is notable, unique or different? We really have three niches. We specialize in cleanroom injection moulding, and whenever I talk about our moulding facilities, it must be made clear that we have toolmaking facilities to back them up. 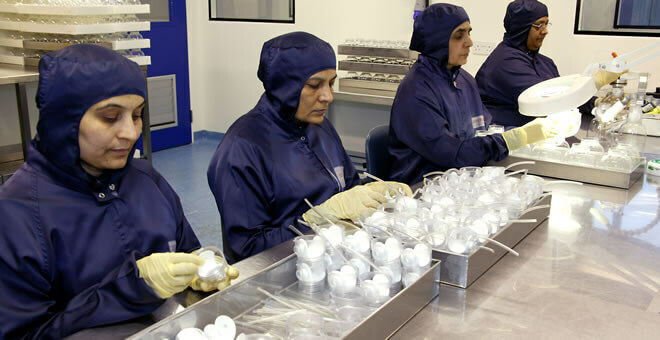 Cleanroom moulding is a major area of growth for us. In terms of custom injection moulding, we excel at work that is technically challenging, not projects for making buckets and spades. We’re not into the commodity items. Our third area of expertise, which is unique, is that we specialize in micromoulding – precision plastic parts ranging from a maximum of 1 gram down to a few thousandths of a gram. Again, anything we can mould we can make the tools for as well. It’s a very specialized area. We had an experience not too long ago where an American company was developing a medical device for wound closure molded in a polymer that was bio-absorbable and needed it to be micromolded. We helped them develop the part and provided the tooling. The product was tested and eventually we built them some production tooling. They even bought a machine identical to ours to run in their own facility producing parts from duplicate tooling made for them by Sovrin. When and how did you get into the industry, what attracted you to it? I started my career as a mold toolmaker with an apprenticeship and went to college at that time. Then I went on to study tool design. Part of designing tools is finding new and more cost-efficient ways to build them – sometimes redrawing a part design is the way to achieve this. My employer at the time noticed me doing this and asked me to come along to talk to the customer we were dealing with at the time. I was fascinated with this interface with the company’s customer base and at that point made a decision to join the Technical Sales team. I have continued in this type of role ever since, dealing with practically every industry where plastic injection moulding is used. Relate a notable “best time” for your company? This is very difficult to answer because there has been a sort of organic growth in the company reacting to the demands of its customer base. Whilst there are some notable markers it’s difficult to separate out any one time. The biggest change for the company was probably when the first Class 10,000 cleanroom was built in 1982. Similarly, relate notable challenges that your company has overcome? We don’t just take a drawing of something and say, okay, we have got a way to make it. We ask a lot of questions about the project – not to be rude or undermine the customer’s expertise but to really understand their goals and the dynamics of the product. We look at a suite of components and how they have to be assembled. We’ve gone to a situation where we’ve got several customers’ products requiring cleanroom manufacture where we have provided complete cleanroom cells. The cell will contain molding machines and automatic assembly machinery to provide a fully assembled, validated product of a consistently high quality at the end. We look at how easy the parts are to handle, to assemble, to function and have complete interchangeability when molded on a suite of multi-cavity tools – we do this in order to provide the best service to the customer. We talk about partnerships with our customers and our suppliers. One of the benefits we get from a partnership with one of our customers is that they have helped educate some of our people on Lean Sigma and Operational Excellence. This enables our people to strip a job down into its constituent parts and rewrite the methodology to provide the most efficient and cost-effective production process. We identify the way to adapt and meet opportunities. Qualifications to ISO standards, registration with the FDA and building manufacturing cells to meet specific manufacturing challenges in cleanroom. Where necessary these facilities have been installed with specialized equipment ranging from four-color pad printing to custom-built laser cutting and welding equipment. On the opposite end of the scale from large production cells we also offer a number of campaign rooms for development projects and short-run assembly. From our point of view, everything we do here is almost always technically challenging. In order to really understand how a thing works, we really try to encourage the people we’re dealing with to talk to us as early as possible in the design stages, when the design is still just a thought on a small piece of paper. They can then get the best marriage of our skills and experience matched with theirs to produce a cost-effective solution to product design and manufacture. List newly acquired technology, machinery or key personnel (in last year). We’ve just taken five new all-electric injection molding machines and they are all Fanuc. Four of them have got integrated six-axis robots. Along with those machines, we’ve installed an automatic assembly machine for a drug delivery device for a pharmaceutical product. I can’t go into too much detail on that. To enable that particular cell to run 24/7 we’ve trained a dedicated team led by a newly employed cell manager. We do tend to develop a lot of our own specialized people within the company. We’ve also installed some new equipment in our toolroom. We bought three U.S. made high-speed mills. These are Haas brand. The other thing we’ve got is a Sodick CNC Sink EDM AP1L machine, which is quite unique and used for small, intricate work. It’s also the first of its kind in Europe, kept originally only in Japan, but we persuaded them to let us have the first one in Europe. Has your company recently expanded? Plans to expand or form partnerships/alliances? No plans to change the nature of the company. It’s a family-owned operation and that’s the way it will stay as far as I can see. The founder of the company, Peter Joiner, started it in the 1960’s and clearly continues to get a real buzz from seeing his enterprise and people flourish. His two sons both have an active role in the business. In 2003 we moved into a new, existing building that we adapted to suit our current production needs. Since then we have doubled the cleanroom production capacity in there, and if we are to expand any more we need to be looking at yet another building or moving ourselves from several buildings into one large one. We’re talking about medical products whose development time is quite long and complex. We’ve been involved in an exciting medical product for three years now, and if that takes off the way we expect it will, it will require us to establish a whole new facility in order to handle its production. Are you involved in any industry organizations or educational programs related to the trade? We’re not involved in any formal organizations within the industry. It’s never really appealed. We continue to work closely with local training agencies to help us find young people who are interested in learning to become toolmakers or molding technicians. We are finding this increasingly difficult because it seems the kids would rather sit in front of a computer. This seems ironic when you think about how much reliance modern tool design and manufacture has on computers through CAD and CAM! We have an apprenticeship program but have not got an apprentice at the moment because it’s been so difficult to find an enthusiastic individual with the right qualities. Maybe I’m being unfair; it could be that today’s youth just don’t see a future for manufacturing in general and toolmaking in particular. What do you think about changes occurring in the industry due to globalization? How has it affected the way you do business? Getting back to my statement that we take on technically challenging work; once those challenges are overcome, work tends to go to lower cost regions. So we just set our mindsets on the fact that we continue to compete using technical superiority and not price. And there is some comfort in the fact that medical and pharmaceutical development is very strong in the U.K. and I’m very proud to say that a major British design firm we’re working with at the moment is working with a US based client in the medical field. We’ve noted that medical companies are cautious in their dealings with China and India at the moment. What will the industry look like in 3 to 5 years? I think the toolmaking industry here is shrinking rapidly. The number of companies we’ve dealt with in the time I’ve worked at Sovrin and have now gone out of business is frightening. The knowledge and skills we’re losing is devastating – it’s not something you can store on a DVD to use later. Commodity products will continue to be more competitive, and while China and India will eventually get into cleanroom molding, it’s not so easy fortunately. The Far East will catch up with us eventually in costs and somewhere else will become the cheap production region for the world. Additional locations: None at this time.